Okieladybug's Scrap N' More: Want To Love ProMarkers? GIVEAWAY! Well guess what! Here is your chance to see if you can love them just like me! I will be giving away a set of 12 ProMarkers donated by Letraset! I would like to thank Capadia from Capadia Designs for giving the introduction for the giveaway and I hope everyone check out her project she made and entered her giveaway. Instructions to enter are at the end of this post. Here is a card I made using similar colors that are included in the set. The stamp set is from Inkadinkado and I got it several years ago when I was on a cupcake kick *okie thinks she probably still is*. The patterned paper is BoBunny. I used Mica Stardream to matte the image. I couldn't believe there were 7 layers of paper when I counted when I got done. I think they all went well together though and show off the cupcakes well. The Stardream Mica does look better in person. That stuff is really hard to photograph sometimes. I added a few heat set gems where the sprinkles were stamped on the image. 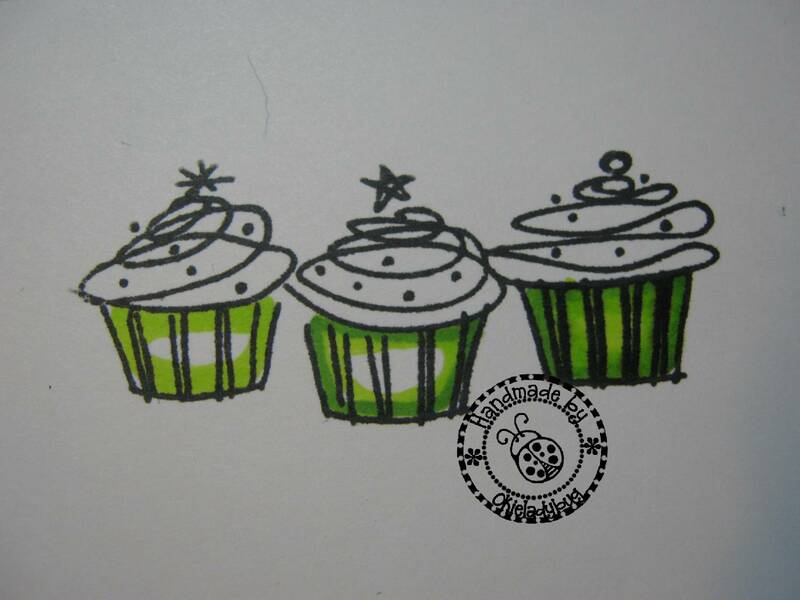 They may look a little too blingy for cupcakes but ya'll know how I love my bling! I used the Imaginisce I-Rock heat set tool to adhere the gems. I get my gems on eBay from ohmymini. They are cheaper than buying in a store but be warned they literally come on a slow boat from China. But well worth the wait! Since the set only has 12 markers and not enough colors to do the fancy shading I thought I would do a tutorial on how you can still get a nice shadow or layer effect with just using one color. I used colors that are included in this set. Remember to click the pictures if you want to see close up details. I colored the wrappers with lime green, leaving white in the middle. I then went around the edges with the Forest Green on each wrapper. Step 2. I colored on top of the forest green with the lime green using a circular motion to blend the colors together. I then colored the rest of the wrapper in with the lime green. For blending I like to use 2 similar colors for a nice layered look but as you can see you are able to get the effect with using just one color. I colored each cupcake with a different color, Rose Pink, Canary and Amethyst. I went back along the lines of the stamped image with the fine tip of the markers with a layer of each color accordingly. The Canary didn't layer as well but that is okay since the pink and purple did. I went finished the rest of the lines and waited a few seconds before going back over them again to get a deeper color. 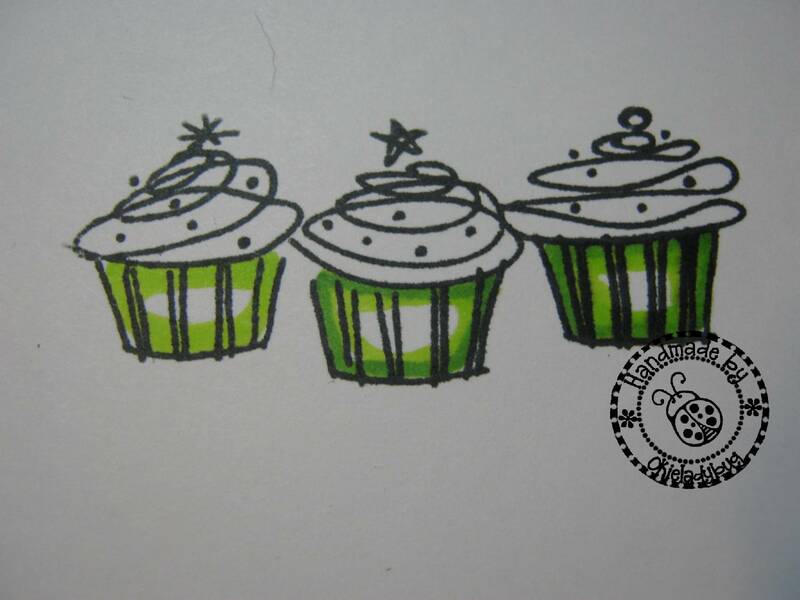 For the shadow I drew a little area below the cupcakes with the Cool Grey 3 and then filled it in. So to enter what you will need to do is leave a comment on this post stating why you would like to win the markers and leave contact information so I can reach you if you are the winner. Yep, that's all you have to do. You guys know by now I don't like all the mumbo jumbo and jumping through hoops to enter so I make it easy to enter. Deadline will be Saturday January 8, 2011 at midnight. GOOD LUCK! I use sharpie permanent markers to color with and would like to try something different. These look like they would be fun to use. I would love to give these markers a try. Thanks for the chance to win Okie! Love the card.I would love to win cause i love to color. It would help me use all the stamps that I have. I so want to try some. thanks for the chance to win. I would give my best try at learning how to color! I tend not to stamp much because normally when I get done with pencils it looks like a 5 year old did it! I've never used markers before and this would be a great way to be introduced to them. Thank you for the chance & for always sharing your creations. I would love to win these! I can't afford them yet, but hopefully one day! I guess my reason for wanting to win these markers is very simple. I would love the chance to try out a nice set of markers and just can't afford to buy them right now. 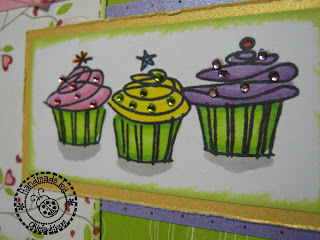 Love the cupcake card, Okie! It is too cute! I would love to win these -- I've wanted ProMarkers or Coptics for awile now, but its just not in the budget anytime soon :( Thanks for the great giveaway! Woo Hoo Great giveaway! Would love to add to my collection of crafting products! LOL A girl can't ever have too much?! Can she?! Actually I am way behind on many products out there. Fairly new to stamping, so would love to build up my supplies for that. Thanks for a chance! I would love to win the markers because I REALLY need another paper crafting addiction!!! Seriously, I really love all your ideas and projects - thanks for sharing them with us!! Wow! Awesome giveaway! I love your card and thanks for the great tutorial! I have heard so many great things about the ProMarkers and I would love to try them! I don't own any fancy markers! Thank you for the chance to win! Nice tutorial on the shading. I cant seem to get it. lol I try and it doesnt work well for me but also could be I am using CHEAPY markers. I would love to win these, my cheapies are running dry and would love to try the promarkers. Thanks for the opportunity to win! I love the cupcakes! I would love to win some pro markers so I could stamp more. Thanks for the awesome giveaway! I would love to win these since I don't have any decent markers to color with and I really do need some. Okie put my name in the hat! BTW, I love the design of your site. I love all the big ladybugs and the polka dots. Extra Cuteness!! you are going to make me have to get these aren't you?? I have to agree - starting another papercrafting addiction is quite tempting - I think I can fit it into my scraproom with all the other stuff! I'd love to try the ProMarkers. OMG what a great giveaway! You did such a great job with these markers, LOVE the cupcakes. Thanks again for the chance to win! Okie, your card is so cute! I really haven't tried coloring on my cards yet, but your tutorial makes me want to give it a try. Thanks for the opportunity to win! I love your blog!! Your so funny, I would love to start coloring with marker's I haven't tried yet. Thanks for the chance to win. So cute Okie!! I have been wanting to try coloring with markers. I just bought my first Tilda stamp, so these would be perfect! Thanks for the giveaway!! Thank you for the tutorial. It always amazes me how wonderful the blending is with markers. I have never used markers before as I have only used colored pencils. I would love to try them! Thanks for the chance to win. Okie, such a great giveaway. I have been reading about how great these markers are and would love to start a collection. Cute! Hubby got me some Bic Markers for x-mas but I'd really like to try these ones too. What a cute card. I would like to win the markers because I do not have any alcohol based markers and love all of the layering that can be done with them and how they blend so nicely. bobbim1271[at]yahoo[dot]com. Thanks for the chance to win some. Love the card. I would love to give stamping another chance. Not really into it. The pencils didn't work as good as I thought. Would love to use my stamps. Okie, that is a really cute card. Thanks for showing, those of us who just can't invest in the popular Copic markers, that we do have another choice! LOVE THE CARD! I love cupcakes... In any form... I have 1 brown copic marker... Seriously I own 1 marker total. Bought the copic planning to start collecting but just wasn't able to afford them. They cost a GRIP! Anywho... Would love to win these. I'm a copics girl from way back but I would love to try the promarkers. thanks for the chance Okie. Very cute card! I would love to win these markers because I have very few markers to color with! Thanks for the chance to win! Amazing giveaway....i love markers have not tried the pro markers yet...but maybe i will soon..hint hint : ) thanks for the chance to win....you have a wonderful blog. I would love, love, love to win these markers, because I started my card making adventure with my cricut. I am now starting to venture into stamping, and would love some good markers to color in my images! Thanks so much for the chance and for the excellent tutorial! wow, thanks so much for the chance to win. I would love to try the promarkers. I bought some Copics, but I'm not really comfortable with them. Enfys from Going Buggy was the one that got me interested in trying these ProMarkers - Copics just got too darn expensive. So I ordered a few colors to try out and they are super!!! I need some other colors and your giveaway came just in time - thanks for the chance to win this set!! And I love your ideas for the shading!! TFS! I'd love to win these markers because I really haven't done much coloring of stamp impressions with markers. I'd love to win this set to start a new trend for myself! ohhh I would love to try these! I love stamping, but try to stick to words or setiments just because I dont have good markers to color them in. I do admit to using crayola from time to time haha but would like to use something thats not made for children lol. This is a great giveawy! Thanks for the chance!! It has been so long since I've gotten to do something artsy...I am finally getting settled in after a very long drawn out move and would love to give these a try!! Crossing my fingers!! I have used the Copic markers and Sharpies, and would love to try the ProMarkers to compare. They seem to be a better deal that the Copics. I would love to try these out. Thanks for the chance to win! I love bling on everything-the cupcakes looked perfect to me! I'm DROOLING over your beautiful card. And all hyped up about your Giveaway offer. If I would be sooo lucky to be picked I will give the Promarkers a good home!!!! I have been looking at all the posts about the Promarkers and wants some so bad. Thanks for the offer. Rose. Thank you for the step by step tutorial Okie! I've always wondered how that is done. I have no markers and I've been dyeing to try these techniques, so yeah! Precious card! I would love to win these markers because I feel as though I don't have enough addictions. I mean, the only addictions I have are paper, bling, flowers, ink, ribbon, brads etc. I think I am in need of just one more!! No, really I would love to try them. I don't own any type of markers and pros or copics are over my budget! Thanks for this amazing giveaway. You are too kind! Oh Okie, I don't have any quality markers at all... take pity on me! Okie - glad to see you are feeling better - the new year is a good thing. I would love to have the Pro Markers to try before I make a huge investment and find out I'm not as good as you. I am so inspired by your work, especially the Father Christmas card you did in December. Thank you for making it easy to enter your contest, Okie. I don't know anything about using markers to color my cards. I guess that is why they look sorta flat. I bet using markers help a lot. I've been having a terrible time finding a good ink to use, these seem like they would be a breeze to use! you're card is super cute!! I dont have any of these and think they would be fun to use! If Im lucky enough to win them- Thanks for the giveaway! Looks great! Those r some great markers! Love your card. I would love to have a set of these markers to try. I admit I would really have to practice, practice, practice. thanks for the chance to win. I dont have anything like this nor have I ever used them so I am interested in trying them out! wow..those are great! would love to try them out. Love your card! I am always looking for a new crafting addiction, so I would love to try these markers :) I may love them better than my colored pencils! I love these cards and would love to start doing something like them. I'm still hesitant about whether I will be any good at this but I'd love to try. So, Pick Me Pick Me. I would like to win these because I don't have any markers that are very good at blending and making an image look nice. I sometimes use Sharpies but they don't blend very well for me. Thanks for the opportunity to win. And thanks for being you! You know I need these to add to the few that are in my collection, don't you? I swear, if the random number picker picks me, I'll fall over in a dead faint.......and will swear it wasn't rigged! Would love to have these because they'll go with the ones I already have and give me some more opportunities for shading, etc. very cute card!!! I would love to win the markers and have a nice set of markers to use for the cards I make. You are awesome! I'm really trying to expand my stamping knowledge this year and these would give me a great jumpstart. Thanks for the tips on layering the colors. These images look great!! Thanks for the tutorial. I really need to pick up a set of ProMarkers and give them a whirl. I don't have any markers at all--how sad is that?! I've watched several videos and tutorials on how to color with markers and I think I can do it. I'm a disaster with a paintbrush & paints, but I think I could color. Anywho...would love to give it a try. Thanks for the chance to win. BTW, I really enjoy your blog. I would love a set of these markers as I don't have any. Cute card. Love the new look of the blog, btw. Thanks for the opportunity. Hey Okie...thank-you for the chance to win! I guess my reason for entering is that I don't have a set of markers to make these fabulous looking cards like you make! You make it look so easy! Since I am on a crafty buying ban - I would love to win these. I have been looking at all that you have been sharing with these markers and I just love it! Woops! I forgot to leave my contact info. I'm the one that mentioned moving and now need my own markers. I've been wanting to get into the marker craze bc the look is just amazing, but it's such a financial commitment. I want to try it first to see if I'm any good before taking the plunge. Okie lady, I would love, love , love to win these. How awesome are these promarkers!!! thanks for the opportunity in getting a set. 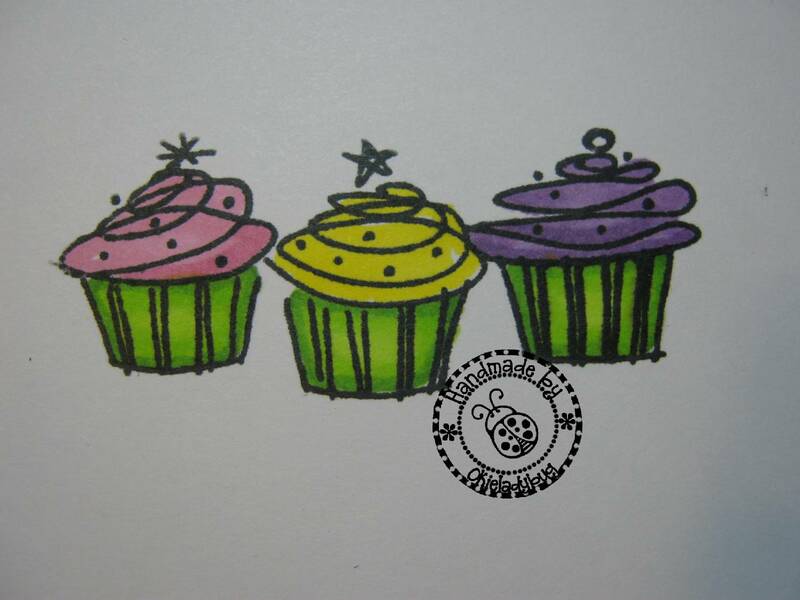 By the way...i love the blingy cupcakes..they are so cute. I am scrappyfrannie and my e-mail is franniecamero@yahoo.com. I would love to win these markers. I have been going back and forth on what type of markers to buy, and you really seem to think that these are great! I trust you -- you always crack me up. Thanks for this opportunity. I think that I can start a new addiction, so if I should win this set I could blame you and me for any addiction trouble I get into with DH. I like to share my problems- it's called not taking all the blame!! Thanks so much for the chance to win. I'm dying to try these markers. I recently left my job to become a SAHM and have been on a spending hiatus when it comes to my crafting. Thanks for a chance to win. coloring with markers looks so fun... and stress-releasing... and calming... I really want the ProMarkers so I can play!! I would LOVE to win these! 12 markers is a good start but I am sure I would have to get more!!! I can just tell my husband it's Okies fault!!! What a beautiful card!! Thanks for the little tutorial on how you used them!! I would love to win these markers, I have gotten a couple and do really like them and would love to add to my collection! Well, I want the markers because I too am an Okie, my birthday is in a couple weeks, and I am just getting into crafting and don't have near enough tools of the trade!!!!! I would love to win these markers because i'd like to try them out before i buy. Copics are too expensive and these seem like a great investment. Great post! Thanks for the chance to win. I would love to win these simply to take my card making to the next step. You make it look so easy that I feel inspired and hope this will jump start my mojo! I have a few markers, don't have a set of markers that are the same kinds. Seems like everytime my LLS gets markers in I have to buy them one or at a time and then my LLS quts selling them, so I can never get enough markers to begin to make a set. It would be so nice to have a nice set of markers. Oh, Okieladybug...you have a winner here! I have priced Copic Markers and have decided that I'd rather have new clothes and shoes...but these seem really nice! I'd love to win a set because Tuesday is my Birthday and my husband says I have my birthday present because he spent a lot on me at Christmastime and our water heater just went out, and I could go on, but I won't. Even if I don't win...I think I could afford to buy these! Thanks for sharing! I don't have any promarkers & would love to try them. Thanks for the chance to win some. And no, there's no such thing as too much bling on a cupcake. i have a few Copics but they are so expensive. Thanks for another chance to win these. Love your blog! Hi Okie. I would like to win these markers as I have a lot of stamps, but am just not motivated by the traditional stuff. Recently the coloring with these amazing markers really has me intrigued! Thanks for the chance to win. Happy New Year. Well pro markers would be fun to try, I have resisted, afraid it will be a new addiction so I haven't shopped for them! I guess I'll have to win some to try them...Thanks for the chance. Love your cupcake card! 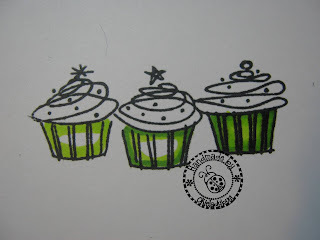 I would love to win these markers to give stamping and coloring a try...I need to step out of the box a little bit. Thanks for the opportunity to win them. Happy New Year Okie. I would love to win this set as I am not a big stamper, even though I own lots. This might help get me in the groove. Besides, love learning something new!!! Thanks for the chance to win!!!! What a nice give away! I'd love to try promarkers. All the projects I've seen with them look awesome and it would be fun to start a new addiction! I have been drooling over all you gals awesome stamp coloring. I have been addicted to youtube tutorials. So i of course have seen your tutorials too. You make it look so easy. I would lOve to win this set and get a good head start on a new adventure. I love learning new things and i can't believe i havent done this yet but im definitely ready. I love your cupcakes Okie! Anyway, love your blog and thanks for sharing. I'm a marker junkie. I would love to win these and give them a try. Thanks for the opportunity Oki. I have a few copics but have been looking at these due to the cost. I would love to win a set and see if they work as well for me. Thanks for the chance to win.. Started as a scrapper and am now getting into stamping and coloring so would love to try these markers. Thanks for the chance to win these! I've been looking at them for a while and have decided I definitely need some, but can't afford them quite yet... I love seeing all the great work you have been doing with them. You did a great job of coloring. I'd love to have a set because maybe I could learn to color as well as you. I have been wanting to try these markers for a longtime. Thank you for the opportunity to win a set. I haven't done very much coloring because it just doesn't look good when I try. Maybe it is because I am using the wrong markers. I would like to try these to confirm it. I would love to win these so I could color just as good as Okie. Hello Okie!! Your cupcakes are beautiful. Thanks for the quick tutorial. I have some markers that I am not really thrilled about (won't slam the company publicly) so I would love to try another brand. I don't colour much but would like to try to do it more!! I love to color! Just used crayons with my 4 year old yesterday. When we first got preggers years ago, my hubby and I had to have a coloring contest to see who earned the right to first teach the kids to color (he won). Now I would love to win these big-girl markers to color on all of my crafty projects! Super cute card! 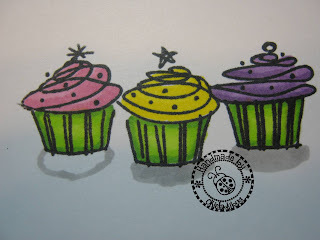 I love the papers and the coloring of the cupcakes. I also like the bling you added to each cupcake! I'd love to try out some of these markers (although I'm not sure I need another addiction). I love the way they blend! Thanks for sharing! wow!! Thanks for the great giveaway! I would use the Promarkers to color in my gazillion stamps! 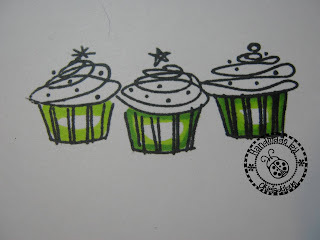 I love your cupcake card! I would love to try those markers! The coloring is just gorgeous.. Bug Hugs! My children seem to have taken over my last set of good markers and ruined them. I haven't replaced yet and would like to try something different. Thanks for the opportunity! OMG, Okie I would LOVE to win these markers! I've been using a small set of Prisma and OMS forever now but would so much rather use markers. I wanted to get into Copics but there is no way I could afford those. These seem perfect! If (hehe), I mean WHEN I give in to the marker addiction, Promarkers at least won't break the bank! Thanks for a chance to win!!! 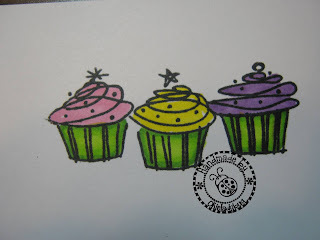 Cute cupcake card! I still need to look to see if I need any of the colors in that set - I like a few. I promise to share the ones I have if I win! I would love to win these markers to take my crafting to the next level. I have never stamped or colored any cards, yet! Thanks for the chance. Love the cupcake card. I would love to win the Promarkers. I don't have any markers at all ...yet! What a great way to be introduced to them by winning them!!!! Your inspiration and all the other bloggers who use Copic markers are why I'd love a set. I've just used colored pencils in the past. I would love to learn how to use these markers for my card making. Looks like alot of fun. Thanks for the opportunity to win. Love the new look of your blog. Thanks for offering up the chance to win these markers. I've been wanting these for a long time and can't wait to give them a try. Your cupcake card came out great! I would love to give markers a try. I haven't used them yet. Capadia sent me. :) Love your blog, card and Lucy. Thanks for sharing. These markers look great. Markers have always intimidated me a bit as I'm always afraid I'll "color outside the lines"! Cheryl. I would love a chance to win the markers. You and Capadia did an awesome job with these. Thanks for the opportunity. I so much enjoy your blog. Love your card..so cute. I would love to win these markers as my new years resolution is not to buy new supplies for 3 months! Thank you for sharing your card and for showing us your painting technique. I would love to win those markers. well, I am almost 66 but I still love to color and would love these ProMarkers! Thanks for the chance to win. Thanks for the demo. OMG ... I need these markers! I've been wanting to try them so badly! Here I am wildly waving my hand in the air, screaming "PICK ME, PICK ME!" I bet you aren't even listening to those screams at all and are going to insist on using that dreaded random number generator thingy! Well, RATS! That's just my luck, screaming my head off for nothing! Hey ... but maybe that random number thingy will pick me anyway! THERE'S ALWAYS HOPE! would love to win these markers to try, you did a great job, I have so many stamps that I never use, this would help get the dust off of them!! Good morning, Okie! Your cupcake tutorial made me hungry! LOL I have a few Copic markers and I love them but they are very expensive and I have to buy only a couple at a time when they go on sale. Would love to try the ProMarkers so thanks for this opportunity to win some. Love the cupcakes! Nice cheery colors and non-Christmas! I love Christmas, but ready to see other colors, great job! I follow you on a regular basis, but Diane has a note on her sight to say "Diane sent me" so she did! Thank you for all your great designs! Oops! Forgot to include my contact info: lucyblueeyz at yahoo dot com. Love the cupcakes! I would love to win these markers since I don't have any. I like what you've done with them and would like to use them for my cards. Thanks! Thanks for the coloring tips. I'd like to win to see if I can finally(!) learn how to color. Thanks! Hi, Okie. Thank you for the tutorial. I would love to win the Pro Markers. I have never used them (or Copics) and since I am not currently working I would not buy them for myself. Thanks for all of the inspiration you give me. The markers I have are so crappy that I don't even want to use them, so I really need to win a set of these babies. You make it look so easy. I need to win these markers. Who would have thought that I like to colour. (canadian spelling) Your card is very cute and I want to try and copy it. :) Thanks for my chance to win. I have always wanted to try Promarkers and to win a whole set would be like a dream come true! Diane from Capadia Designs sent me and I am now a follower of your blog too! 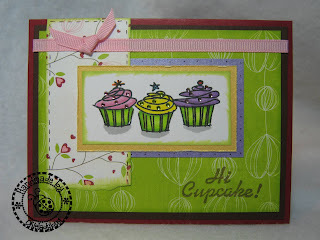 Love your ladybug counter..its so cute and your cupcake card is fantastic! Please give Lucy a big doggie *Hug* from me and my mini schnauzer Jake who was rescued from a puppy mill and I adopted him from our local shelter. Keeping my fingers crossed to win the Promarkers. Thanks for the opportunity! Love the added sprinkles on the cupcakes! I am just starting out and would love some markers to try. I would love to win the markers. Mine are shot! And over the past year, a kind lady at work has given me over a hundred stamps (yes, really). And I haven't won anything yet in my 1-month newness to Blogger Scrapping world! Thanks for the opportunity. Click on my name or icon to respond to me. Totally awesome card and tutorial. I think even I (who can't ever blend colors) would be able to color a project using ProMarker and your instrucktions. Great giveaway, Sounds like the best pens on the market! I love pens and I don't have these. These may be my favorite. It is wonderful what you can do with the right tools, the end product looks so realistic as these cupcakes. Thanks for the opportunity to win. I'd love to start stamping and those markers look like the right ones to use to color the stamp. I would absolutely love to colour with ProMarkers! I have used pencil crayons and all sorts of things to colour images on my cards, but not markers. They make everything look so pretty! sfread171 at hotmail dot com. 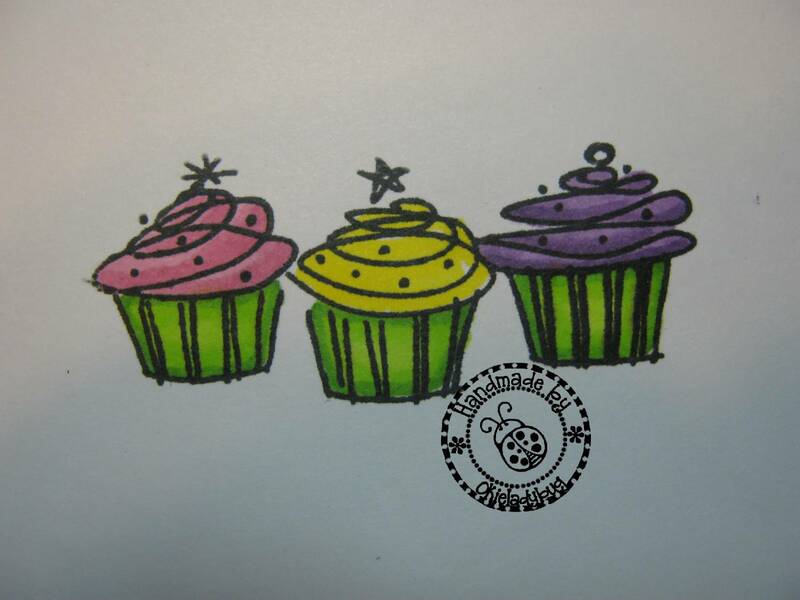 I would love a chance to win these markers, hopefully it would make me a better stamper...your cupcake card is adorable! Very cool markers I would love to win them!! I want ProMarkers because I like the beautiful results I have seen on projects. I love to color but I don't have any alcohol markers because they just cost too much! I would soooo grateful if you picked me to win this set!!! I am really starting to think I really like these markers. I have tried other markers before but either they were crap or I wasn't doing it right! I would love a chance to try to get it right with a set of these!! Thanks for that chance to win. I found out about your site from Capadia Designs. For now I have been using colored pencils and they designs don't look nearly half as good as yours. I would love to win the ProMarkers! *Raises hand* I solemnly swear I shall not blame Okie if I get addicted to ProMarkers. ;^) I would love to win these markers! They seem like are GREAT alternative to the other markers out there and are much cheaper! This would help me out as I try to get my crafty fun money stretch as far as possible. I would like to win these markers because I'd like to try something new to color in my stamped images. Great card Okie. Love the "feel" of the cupcakes. Thanks for the great give away too. I'd love to try the Pro-Markers. I believe they would add a lot to my card making. beautifulmountainfarm at gmail dot com. I would love to win these! I don't have any of this type of marker. Before I invest the money I would love to try them out first. Thanks for the chance! I'd love to win these! Love your cupcakes! love your work with these markers!!! so pro looking GREAT JOB!!!! !im so wanting to win these markers!!! Great giveaway and your card is awesome, I have never used markers but really would like to try to spice up my cards & Lo. Have a great day and Capadia sent me over!! Glad you are feeling better! Great new look! Thanks for sharing your beautiful card and tips! I'd love to try the ProMarkers because I haven't used markers yet. I would love to win the markers. I am new to your blog but I will be back. Thank you for the opportunity. 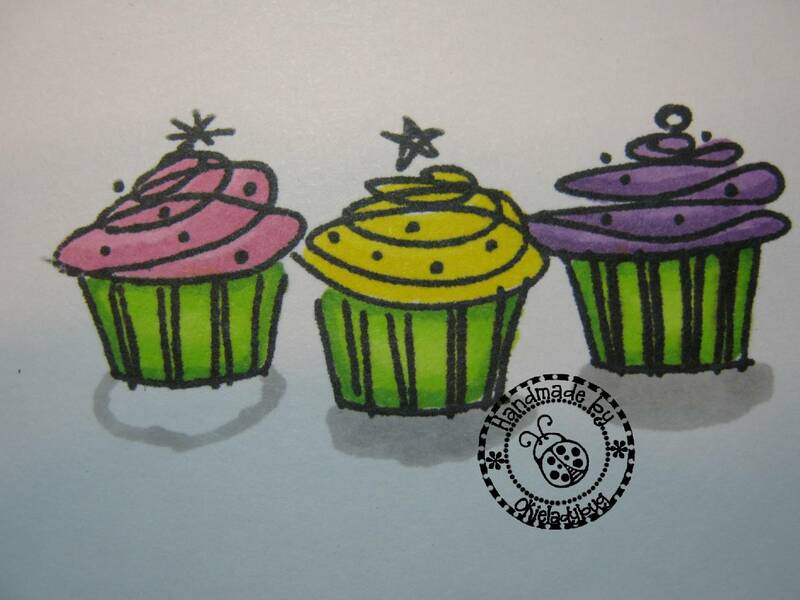 I would LOVE to win these markers for a couple of reasons...1) you did a fabulous job with the cupcakes and I'd welcome the opportunity to see if I could do a good job with them too; 2) I have wanted to try these (or the copics) for a long time but can't ssem to find the money for them. TFS your awesome talent with us! Oh Okie, I do, I do, I do want to love ProMarkers! Thanks so much for the chance to win! These would be so awesome to win. I have only a couple of other brand and need new ones to color all these stamps I have accumulated somehow. LOL thanks Okie!!!! Wow! Heard these are great. Am just learning new techniques and would love to try these. Copics are a little too expensive for me. Thanks! I would love to win a set because I've been dieing to try them but my budget just does not allow it. I see all the beautiful creations everyone makes with the pens and it's frustrating that I can't bring my cardmaking up a notch. Thanks for the chance to win. I hope you have a great day! Love the card and tutorial. I've also wanted to try ProMarkers also. They seem so easy and would be fun to use. You make using these markers so easy, I'd love to give them a try! I make quite a lot of cards and this sure would be great to try to work with ! What you do looks so nice !! 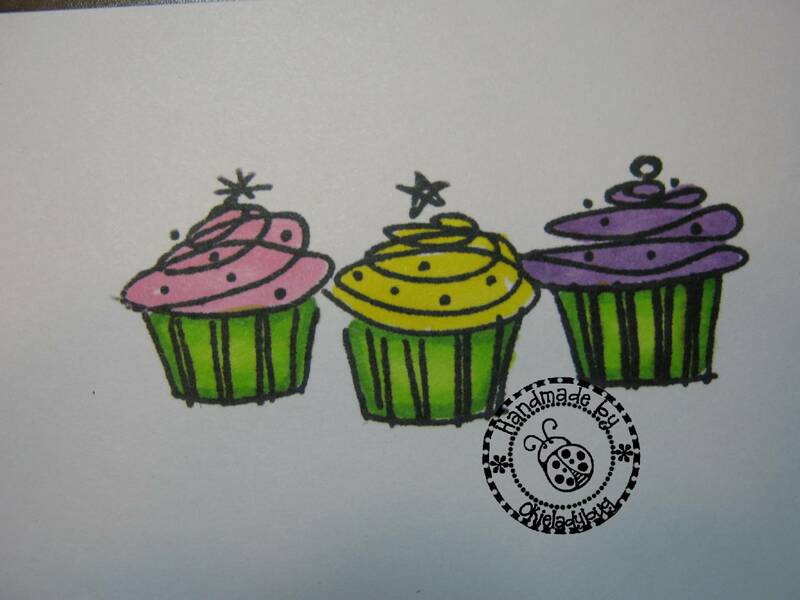 I love the cupcake coloring and the tutorial and I would love to be able to give the ProMarkers a try for myself. Thanks for the chance to win some.